(Francisco Kjolseth | The Salt Lake Tribune) Brandon Urry, first time user of Bird, a dockless e-scooter company that aims to help people with the last mile of transit, catches a ride to his car on one of the recently dropped scooters in downtown Salt Lake City on Tuesday, July 3, 2018. The city who was initially not notified of the new company is trying to bring them into compliance with ordinances and regulations and create an operating an operating agreement for them to work under. Salt Lake City residents can expect to see dockless e-scooters on the streets again, now that the company that dropped them there at the end of last month — without notice and without adhering with city code — has signed a temporary operating agreement and obtained a business license. Bird took its scooters off the streets once the city notified the company it was out of compliance. Since then, the city has scrambled to draft an operating agreement that would create licensing requirements, safety regulations, and limits on how many dockless scooters and bikes can be scattered around. The city developed its agreement based on “national best practices” and worked with vendors to address “safety as the No. 1 concern” of the new technology, according to spokesman Matthew Rojas. And now that it has some regulations in place, residents may see similar businesses flood in. The city’s long-term plan is to draft an ordinance that will regulate the services, but that could take six to eight months. In the meantime, the one-year operating agreement requires Bird and companies like it to share aggregate data about how many people are riding, puts limits on where scooters can be left (they can’t be dropped in driveways, on private property or sidewalks). The agreement also seeks to ensure underserved west-side communities have access to the service. 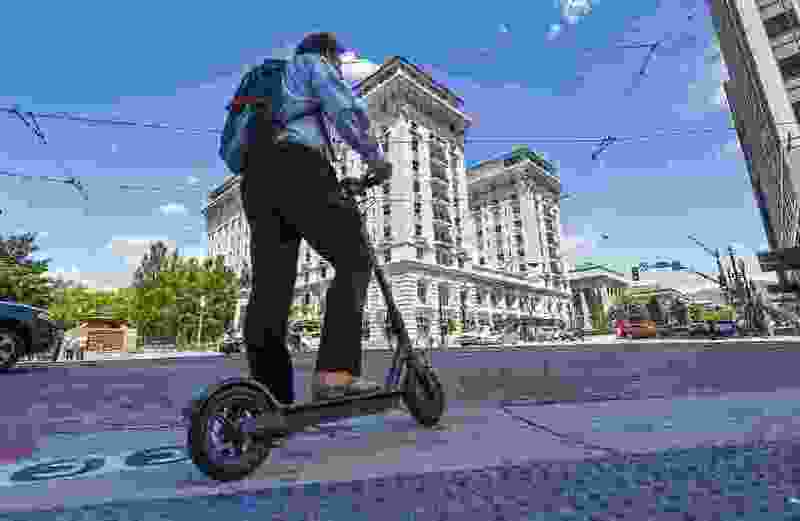 To do that, Bird may deploy a maximum 200 e-scooters around the city on a daily basis and an additional 100 per day if they are in the area west of I-15. If that geographic requirement is met, Bird is allowed to increase its fleet to 500 per day. “We really wanted to focus on the principle of equity as it came to this sort of transportation alternative,” Rojas said. Under the agreement, a company can have up to 500 dockless mobility devices, which would allow more scooters than Chicago, New York, Washington and Boulder have approved. Led by a former Uber and Lyft executive, Bird aims to bridge the gap in a person’s last mile of transportation and to “reduce car trips — especially the roughly 40 percent of trips under two miles — thereby reducing traffic, congestion, and greenhouse gas emissions,” according to its website. The company is known for dropping its devices on city streets without notice and complying with local regulations later. But if Bird fails to adhere to city policy in the future, Rojas said officials can cancel the agreement at any time. Officials will also re-evaluate the agreement monthly to see if changes need to be made. Bird users must be 18 or older with a valid driver license and must bring their own helmets, if they want one. There are no docking stations, meaning riders can simply drop the vehicle wherever their journey ends. To rent one, a rider must download the company’s app to locate and unlock a nearby scooter. It costs $1 initially to rent, plus 15 cents a minute. The city has set up an email address to field questions, comments and suggestions about the agreement and the new dockless scooters at dockless@slcgov.com.